If you have a garage, you want it to be packed with all the things that are necessary for the kind of work that takes place there. 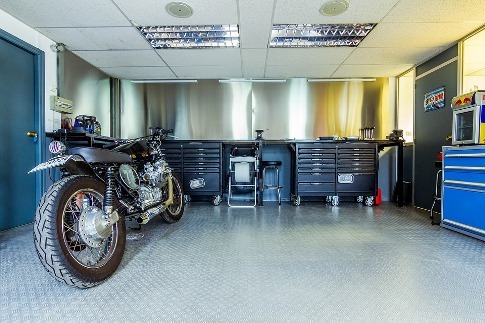 A properly equipped garage does more than just make it possible for you to work on your car – it makes sure that the environment is more effective and enjoyable. Also, there are tools that every garage needs to have, no matter whether you are working on big projects or just doing basic maintenance. Having a well-equipped garage can save you from a lot of frustration. Here are 5 things that your garage needs to have. Proper lighting is simply a necessity for working in your garage. In the case that it’s your place to work on DIY or craft projects, a good light is a savior from eye strain. What you should consider is installing good lighting in the ceiling. This includes spotlights as well as portable lights, which you can move around when working in a particular area, or looking for items that have fallen down to the floor. It’s more than just about how bright it is, you need your garage to be well-lit – to have enough clean, diffuse light that creates less shadow. The fact is that your garage is an enclosed space that holds gasoline which is an explosive liquid, batteries, which is a strong electrical energy source, and a variety of materials that can be set on fire if you aren’t careful enough. Therefore, in order for your car, your garage, and of course, anyone who works in it is kept perfectly safe, you need to have a fire extinguisher at your disposal. You surely want to prevent any serious fires in your garage. When working in your garage, there are three kinds of screws that you will come across. These are flathead (with a slotted head), Phillips (with a plus-sign head), and Torx (with a six-point star). The first two are the ones that you will commonly work with, while the third one is the kind that you’ll come across more rarely, but still quite possibly at critical moments during your projects. Therefore, it’s a good idea to have a complete set of screwdrivers that can handle all of these screws. You also need screwdrivers with different handle sizes, so that you can get them where they need to reach. There is a number of common car problems that you can fix yourself. What anyone who has any experience will tell you is that you simply need to have a torque wrench. What it does is that it enables you to tighten fasteners to their original factory specification. This is essential when you are in need of a car repair. The wheel lug needs to be tight enough for normal driving. Furthermore, you don’t want any sensitive component to be over-tightened, because it can sustain damage. The torque wrench makes sure that you get this done properly. People tend to not make the best out of their garage wall space. You need to make use of all that space. A good idea is to install a slatwall, which enables you to incorporate storage accessories like cabinets, shelves, and hooks. This is a great solution for keeping your garage tidy, and not having any clutter on your floor. Your garage needs to be properly packed in order for it to be truly useful. It needs to have proper lighting so that you can see what you are doing. A fire extinguisher is necessary in case of a hazardous event. A screwdriver set and a torque wrench are a must for proper car repair. Finally, you need to make the best out of your wall space by incorporating a wall storage.